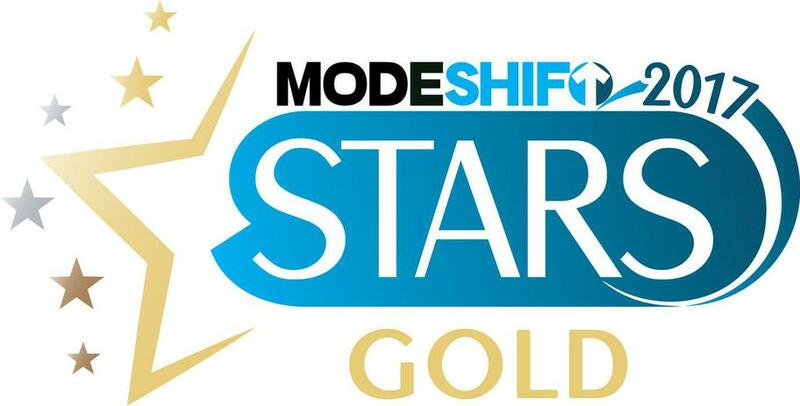 We are proud to have achieved our Gold Star Modeshift Award in September 2017. 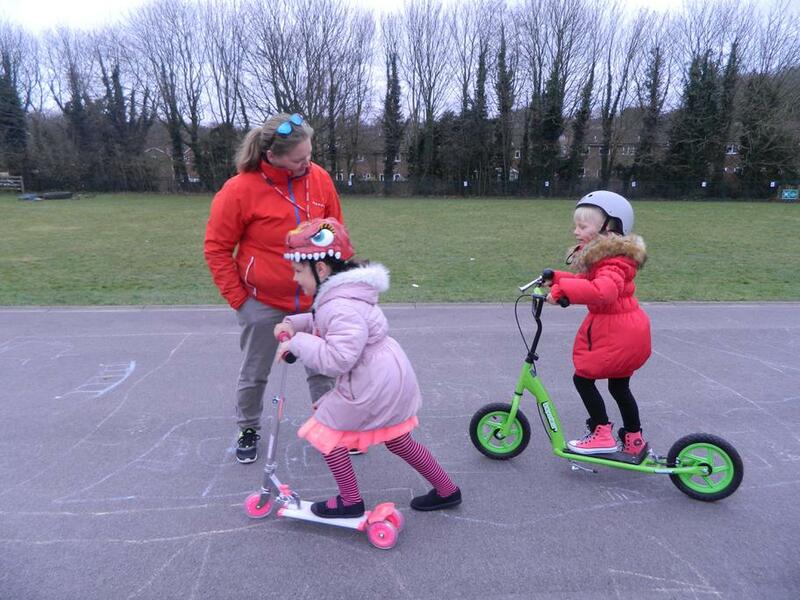 Hatch Warren Infant School is constantly working hard to ensure the children's safety including at the start and end of each school day. The school is also working in consultation with the School Travel Plan Team and with the Junior school. We have a Travel team which has representatives from both schools, parents, councillors, local residents and the school travel team. We re launched Park and Stride on the 19th October from the Portsmouth Arms. We had a great turnout and were really pleased to see so many people using this facility. Please keep up the good work. We have been lucky enough to purchase some new signs to make paring safer outside school thanks to the generosity of Councillor Stephen Reid. These new signs have been used to remind parents where to think about parking safely. We had another amazing day in school. 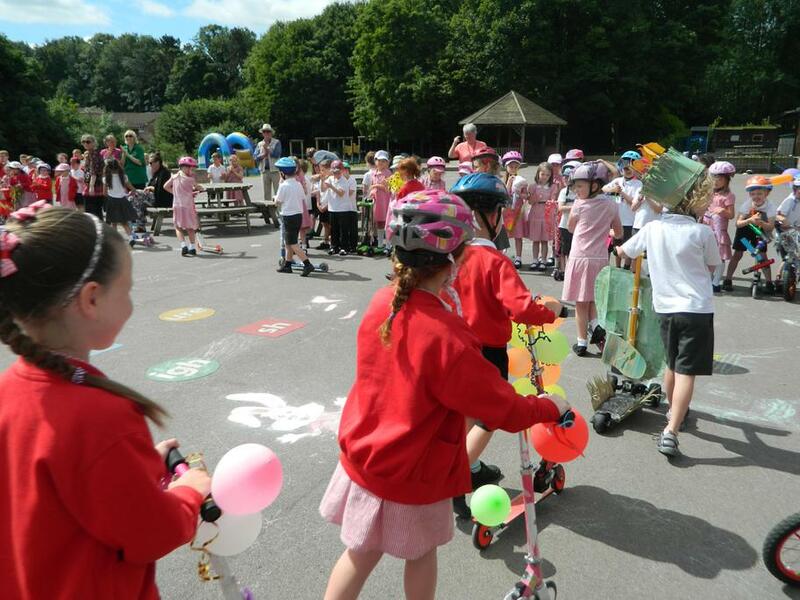 The children paraded their fantastic creations - thank you to all those who took part. 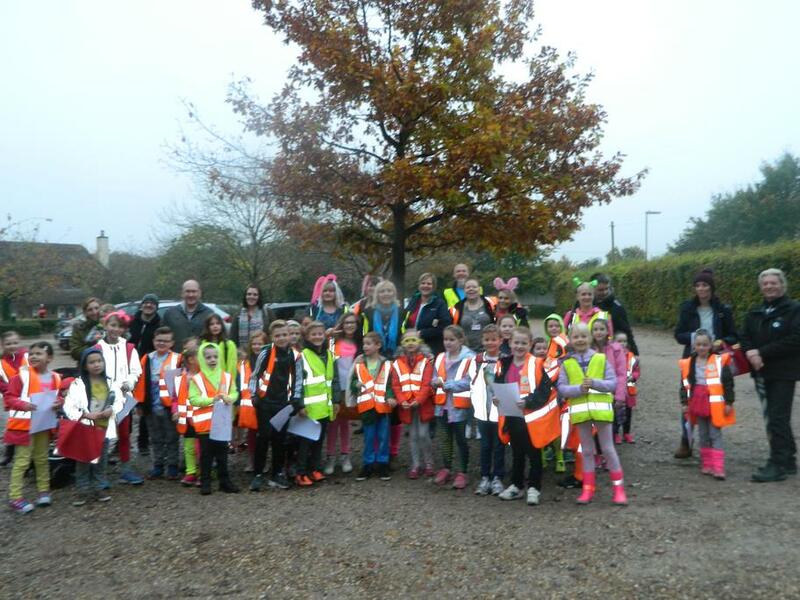 Year R took part in a road safety day in November 2017. The children had a fun day and learn a lot. 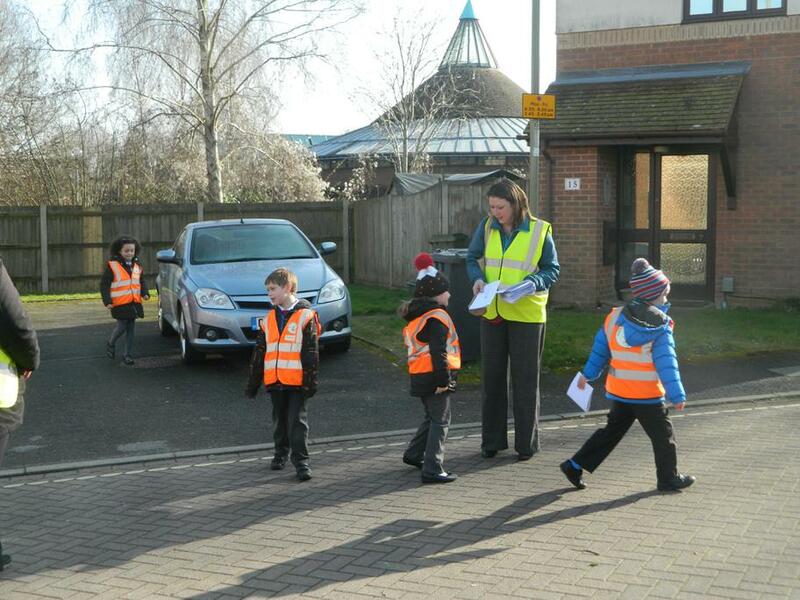 They did a range of road safety activities throughout the day. 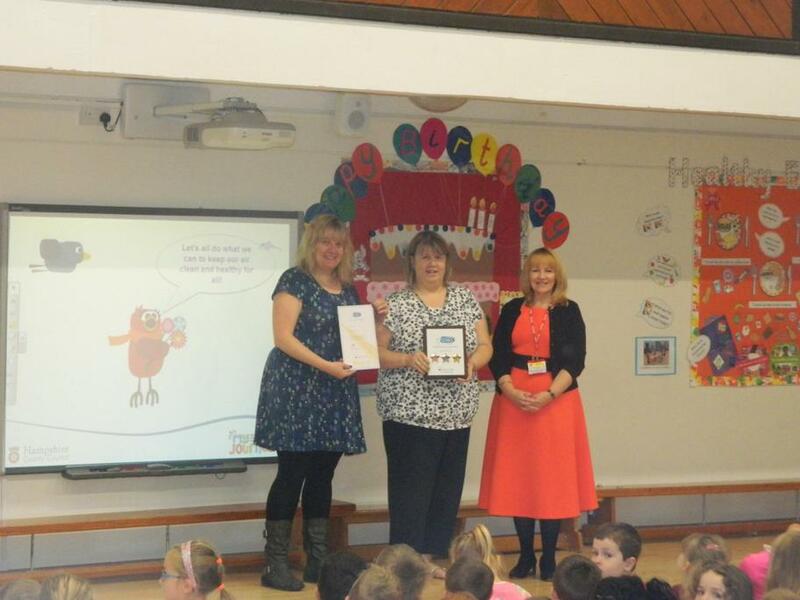 Hatch Warren Infant School won an award for the best school in Hampshire for School Travel at the Modeshift awards in November 22017. We are very proud of our achievements. The School Travel Team, Councillor Terri Reid, County Councillor Stephen Reid and our Travel Champion from our Governors, Keith Bastin attended a special assembly to present our Gold Modeshift award. We are very proud to have achieved this award but we will continue to explore ways to reduce the number of children coming to school by car. 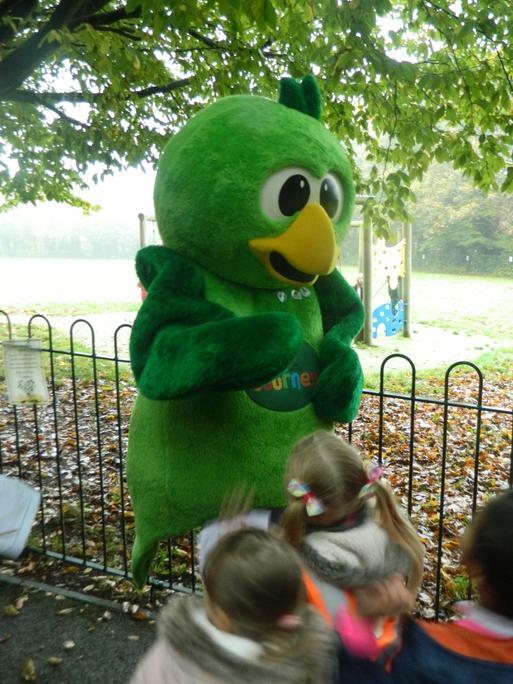 We relaunched Park and Stride with the School Travel Team as part of Walktober and an Air pollution fact hunt. 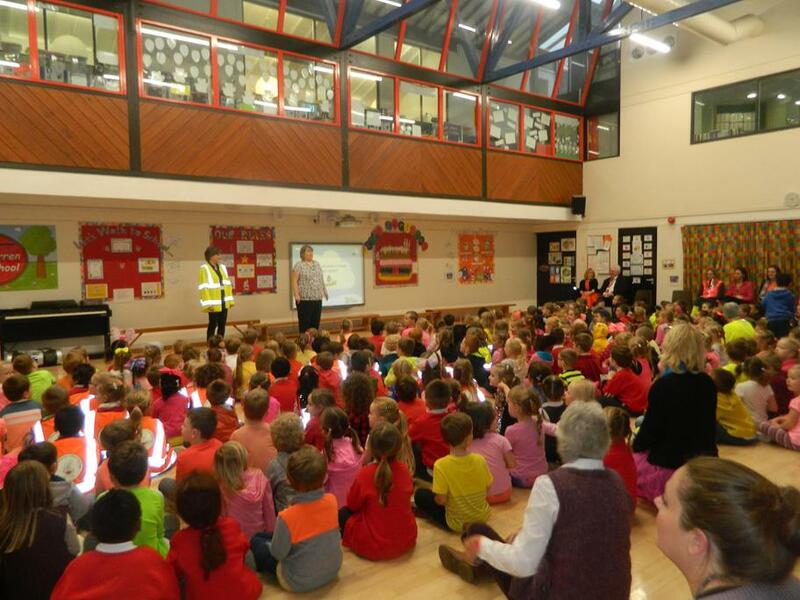 The School Travel Team led an assembly and explained to the children how they could improve the quality of air they breathe in by encouraging their parents to switch off their engines when the car is not moving. 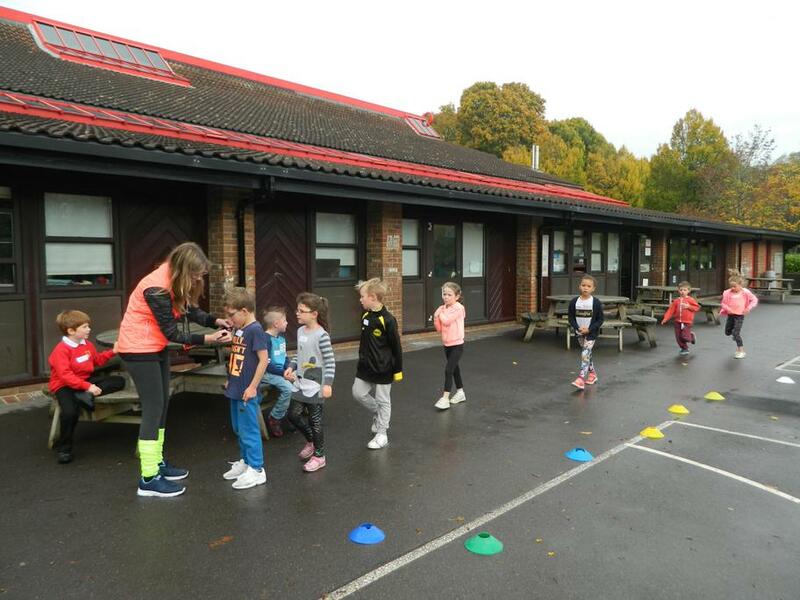 The children came to school in a variety of clothes to support our Be Bright Be Seen day and took part in our sponsored run. They had great fun. We had such an amazing day in school. 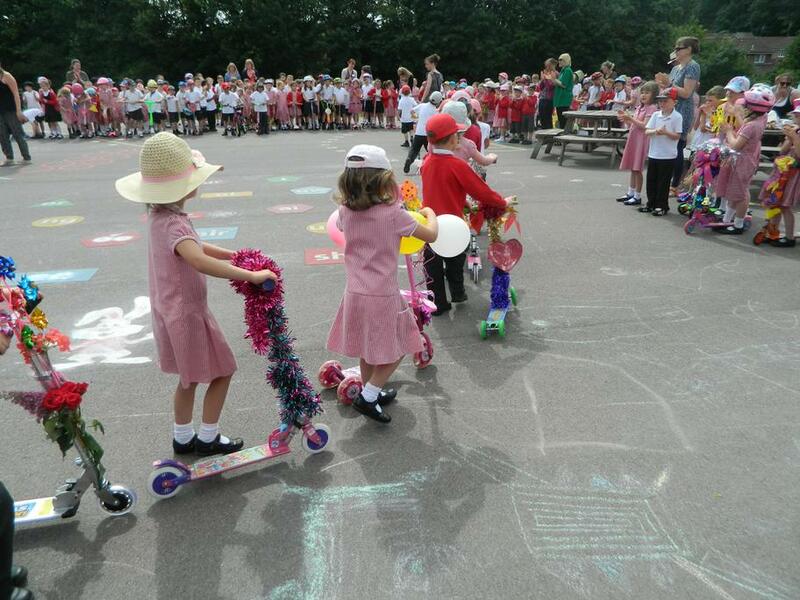 The children paraded their fantastic creations - thank you to all those who took part. School Council have been discussing their views on coming to and from school with their classes. We have created a leaflet with a Parkwise Pledge which we have distributed to all families and local residents reminding them of their responsibilities. Please sign up to our Parkwise Pledge and support us. School Council delivering leaflets to the local residents in Byrd Gardens, Ellington Drive, Hatchwarren Lane and The Cornfields ~ February 2017. 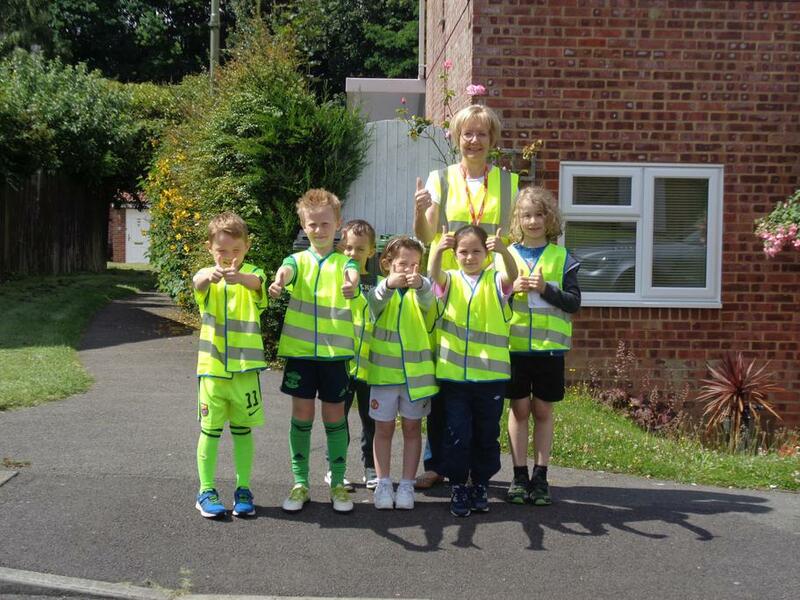 We are excited to tell you about a new walk to school project that our school will be running this year with national charity Living Streets and Hampshire County Council. 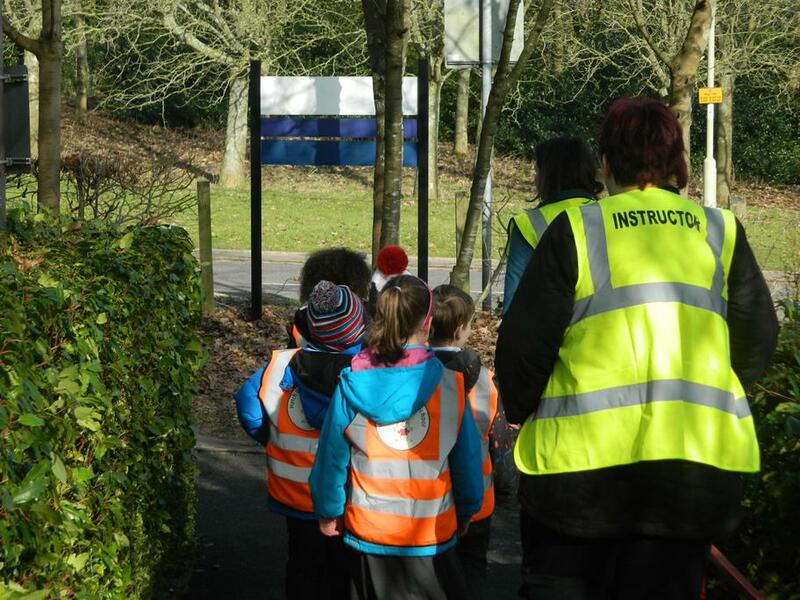 Selected schools in Hampshire have been invited to participate in the project which encourages pupils and their families to walk to school at least once a week through an initiative called WoW. 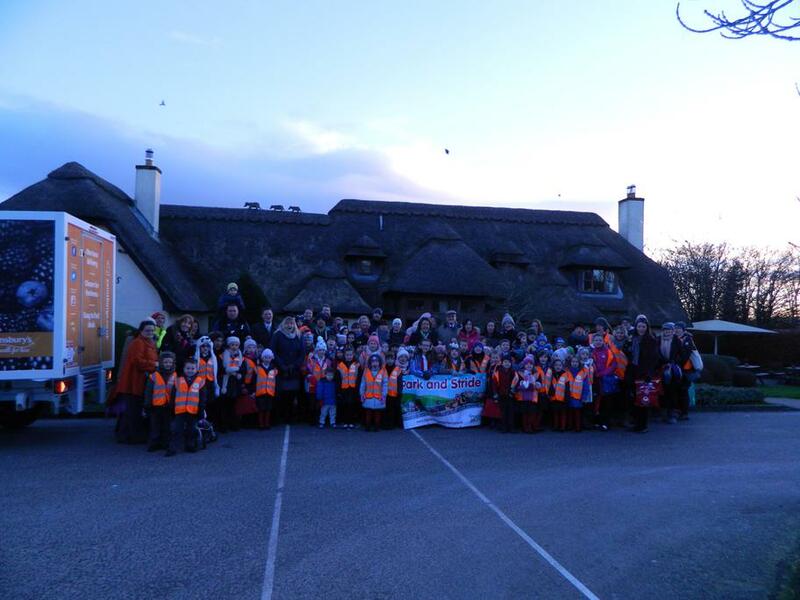 WoW is a scheme run by Living Streets, the charity behind the national Walk to School campaign, which encourages families to walk to school at least once a week. At the end of each month, children who walked at least once every week will receive a special collectable pin badge. There is a different badge to collect for each month of the school year, for 2016-2017 the theme of the badges is Our Neighbourhood. What if we can’t walk to school? If you live too far away or don’t have time to walk the whole way to school, all children can participate in WoW by walking at least 10 minutes to school. If driving we recommend that you Park and Stride to earn your WoW badge - park safely away from the school e.g. at a friend’s house - and walk the rest of the way. Why are we encouraging walking to school? 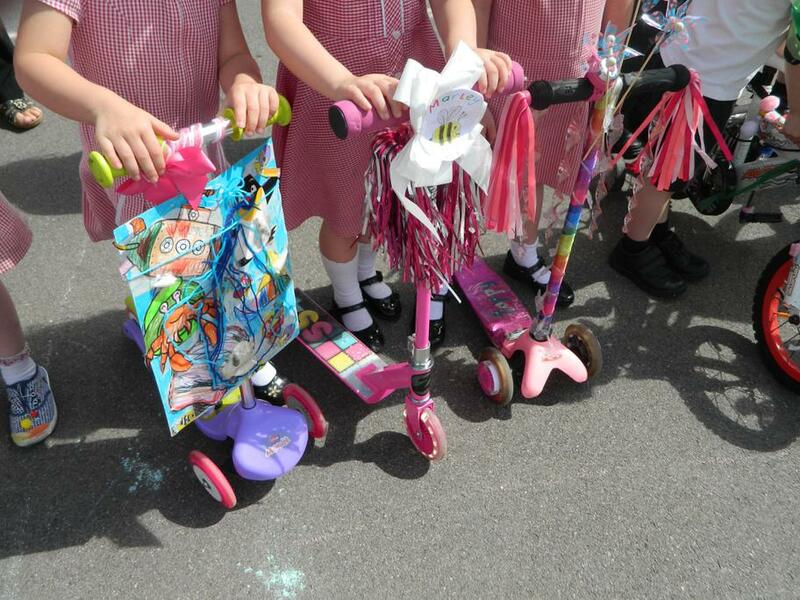 Under half of UK children walk to school and this number is decreasing, whilst the number of children being driven to school has doubled in the last 20 years. Our school is taking part because of the many benefits we believe it will bring to our children and the community. If you have any questions about the programme, please contact Louise Weston or visit livingstreets.org.uk/walktoschool for more information. 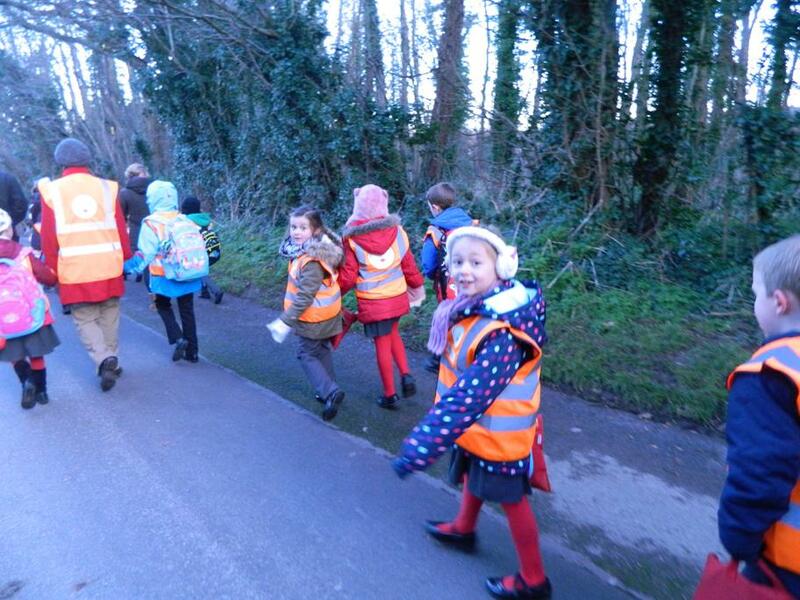 We hope that you join in with this fun project so your family can enjoy the benefits of walking to school. Smarter ways to school ~ Interactive Route finder.....click to find different ways that you could travel to school. You will need to put in your home and the school postcode RG22 4PQ . Links to overgrown hedges etc. Please use this link to report overgrown pathways and routes to school. 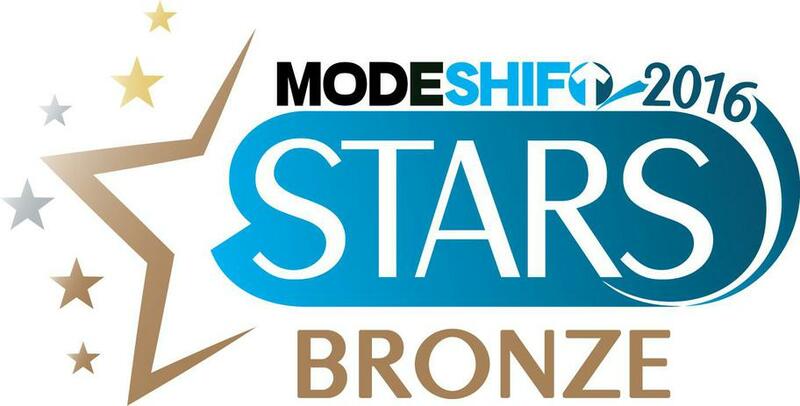 We are proud to have achieved our Bronze Star Modeshift Award in March 2016 - thank you for supporting us. 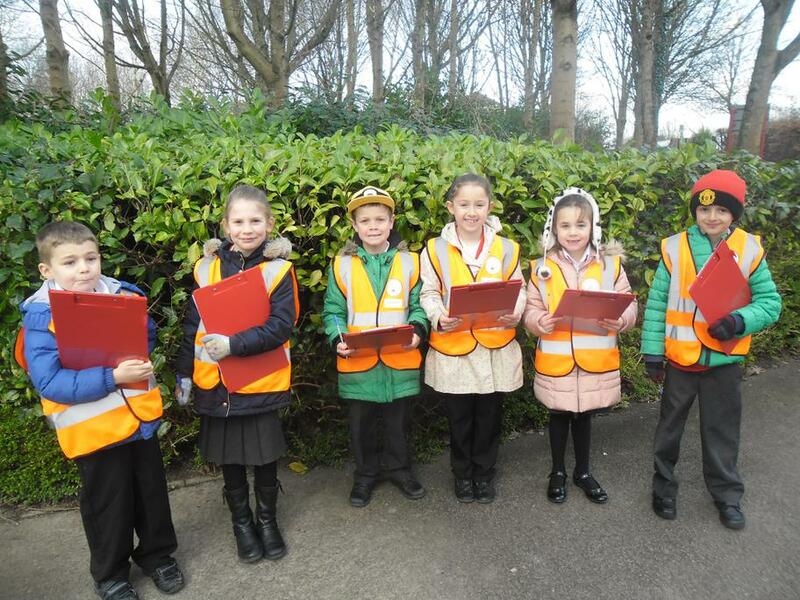 The Year 2 children completed their Pedestrian training and learnt how to use the roads safely. Please support us by taking part in this event.........the cards can be used to record when the children have walked and they will be awarded a certificate for taking part. 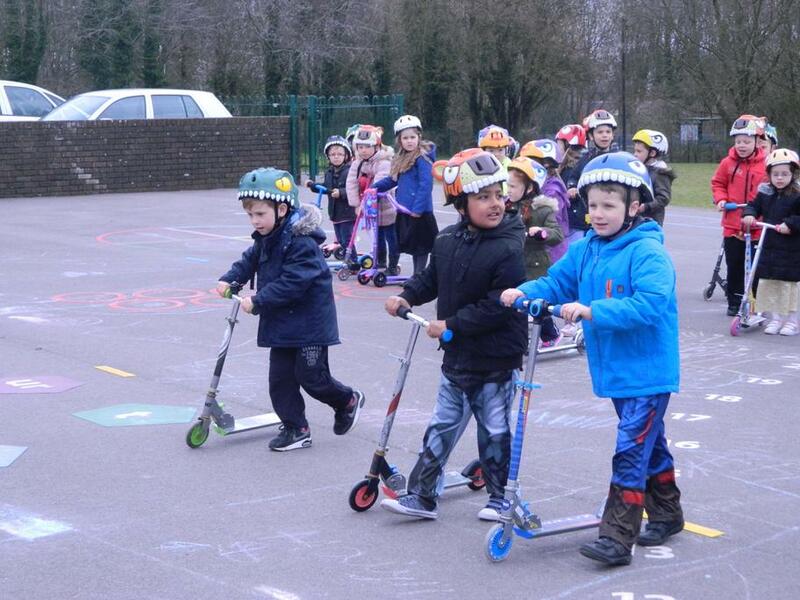 The Year 1 children completed their Scooter training and learnt how to use their scooters safely. 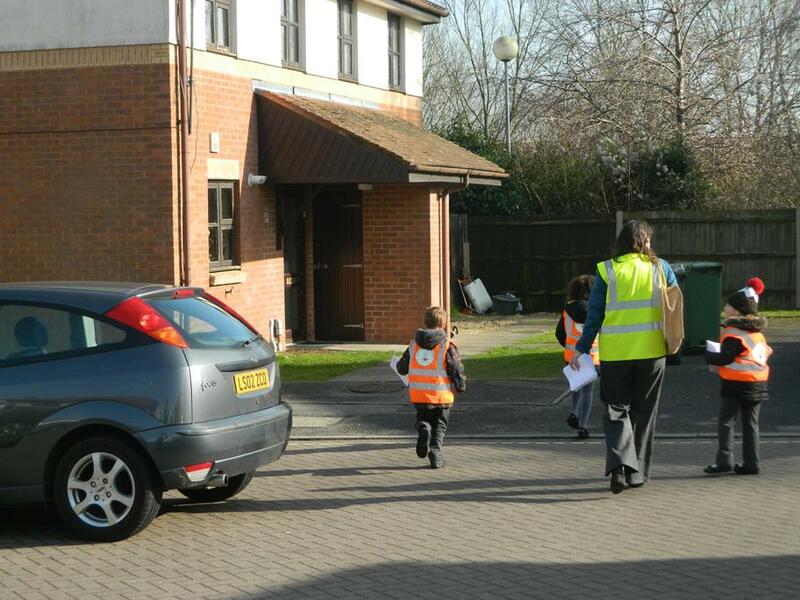 They counted cars and were able to see how parents and children arrived at school. They also saw how safe it was on the road outside school. 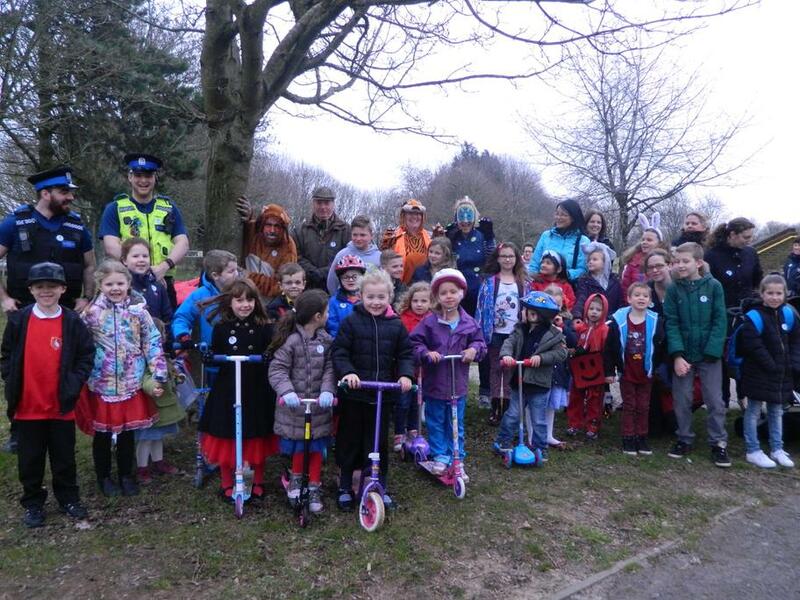 On Thursday 24th March we launched our second Park and Stride site from the Football Pitches Car park. 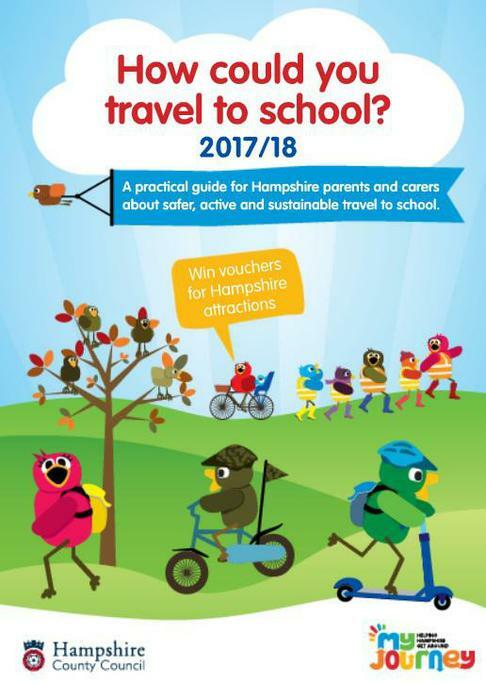 Hampshire's School Travel Team and Histrionics attended the event. 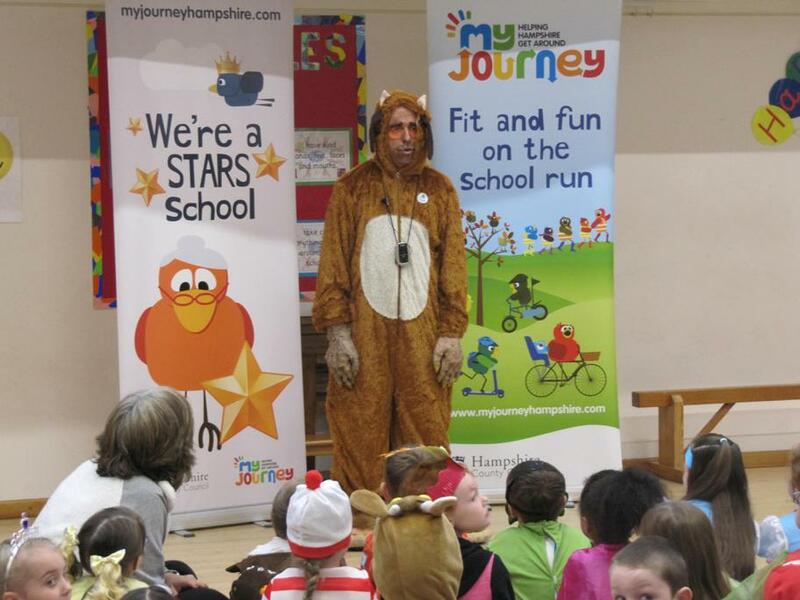 Histrionics in the form of The Gruffalo performed in school after the launch....the children loved his antics!!! This performance was to celebrate achieving our Modeshift Bronze Star - well done everyone! As you may be aware, we are working very hard to try and reduce congestion at the school gates. It is hoped that by doing this, the school gates will be a safer place, thus encouraging more parents/carers to walk their children to school. 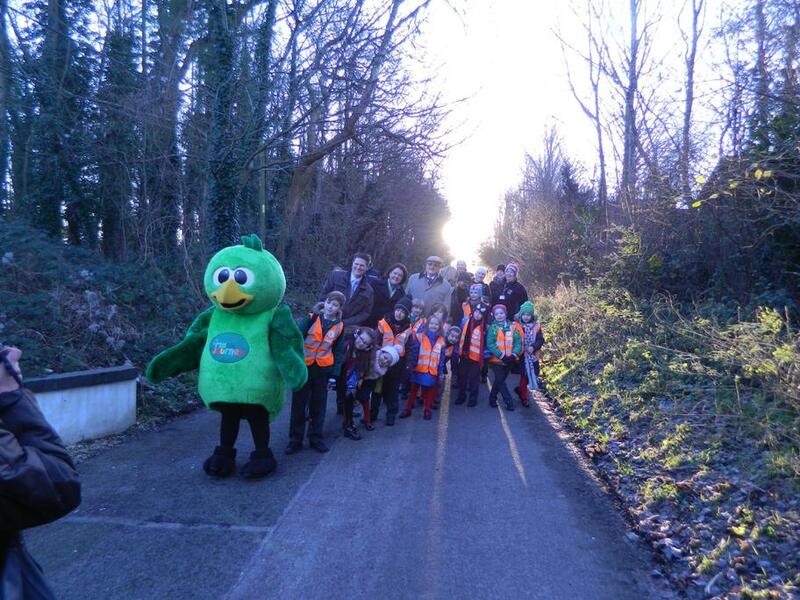 We launched our Park and Stride event on Friday 15th January with the help of lots of families, Maria Miller, Councillor Gurden, Basingstoke Gazette, Sainsburys and of course Basil Bird! 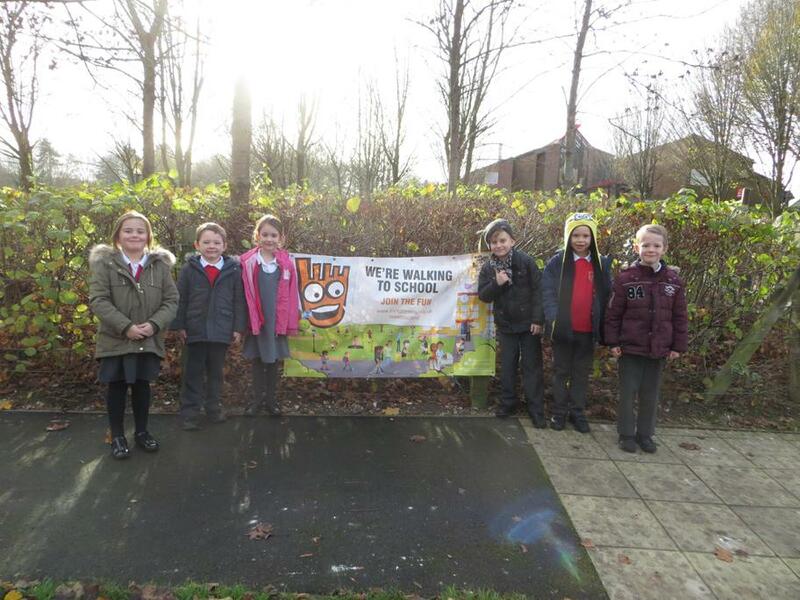 Park and Stride is a simple initiative, where parents/ carers are encouraged to park their car a 10 minute walk from school and then walk the rest of the way. We had a great turn out...thank you for your support. We would really appreciate you Parking and Striding whenever you can.